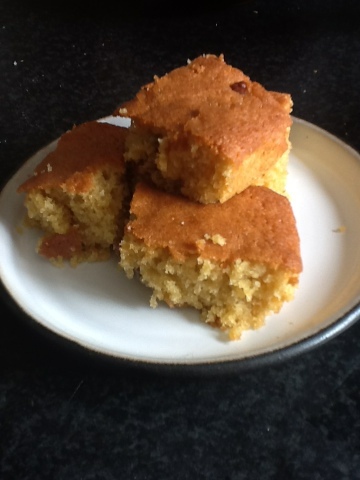 Not as tooth achingly sweet as other blondies I've had, and with a real butterscotch tang. Great bars for when you need a sweet hit but can't have chocolate. Preheat oven to 160 C fan. As its preheating toast 3/4 cup of pecans in it until 1 shade darker. Melt 3/4 cup butter in a pan. Remove from heat. Stir in 1 cup +1 tbsp soft brown sugar. Remove from heat and let cool for a couple of mins. Stir in 1 1/2 cups plain flour, 1/2 tsp baking powder, 1 tsp vanilla, 2 eggs and a pinch of salt. Add the pecans. Stir till combined. Pour into a lined 9 in square tin. Bake for 12-15 mins till golden, no longer runny when you tip it but still slightly gooey in the middle. Cool in tin. Cut into 16. Best first day when still warm, but stays gooey for days, just the nuts get a little soggy. Hi, this is my first visit to your blog, and i must say these blondies look like a delicious indulgence! They look so moist, perfect for a cuppa!